Include floor levels that are entirely above grade and exclude floor levels if any portion is below grade. Below grade levels may be measured, but the area must not be included in the RMS area. Include all additions to the main structure and conversions if above grade areas within the structure of they are weatherproof and suitable for year-round use. You must ensure your clients understand the RMS and its implications. This discussion will help them make informed decisions about the size and suitability of properties. What is the purpose of the Residential Measurement Standard (RMS)? How do I measure properties according to the RMS? It depends on the type of property you are measuring. Measure detached properties using the exterior wall at the foundation. Detached properties include fully detached bare land condominiums. Measure attached properties using the interior perimeter walls at floor level. Attached properties include half-duplexes, townhouses, and apartments. 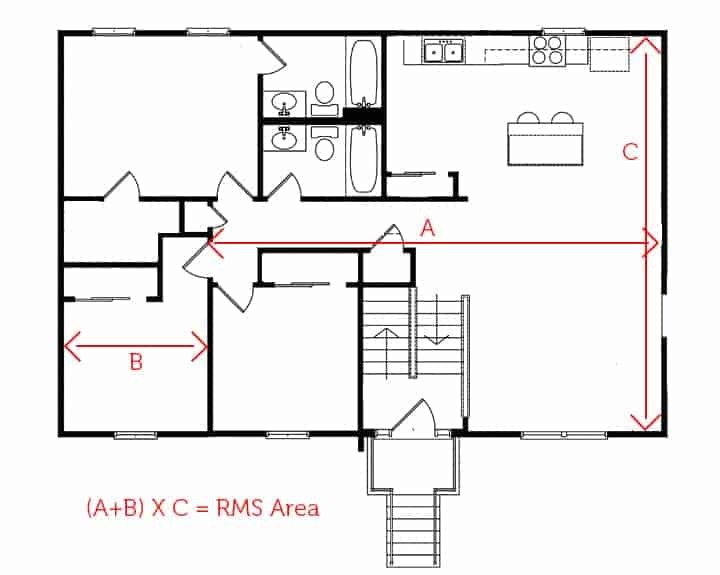 Do I have to measure every room and closet in an attached property? No. You can use long runs. How do I compare attached and detached properties? To compare different types of residential properties, real estate professionals can provide an additional measurement for attached properties using the property’s exterior. Real estate professionals must base this additional measurement on reasonable assumptions about the exterior wall thickness, and can extrapolate the exterior wall thickness from the thickness of the exterior door casings and/ or exterior window casings. If real estate professionals provide additional measurements based on exterior assumptions, they must make it clear it is not the RMS area for the property, and explain their assumptions. Do I have to communicate the RMS for every property I list? If the seller wants you to communicate the size of the listing and/or the listing service/property database has a mandatory property size field, it must be the RMS. Do I have to measure the property myself? I am listing a 2-storey condominium apartment in a large building where all apartments are the same. The apartments are 2-storey apartments. The apartment I am listing is on the ground level and one of the stories in the apartment is 2-feet below grade. If I don’t include the below grade portion of the apartment, the apartment will appear to be significantly smaller in my local board’s database than other same size apartments in the same building. How should I deal with this situation? The RMS provides an exception for properties that are entirely below grade. The outcome of this exception means that if apartments in a building were the same and were one level, there would be no discrepancy between all ofthe apartments in the building except that the apartments below grade would have a clarification to say that the entire property is below grade. To be consistent with this outcome, you can include the below grade portion in your local board’s RMS field, but you will need to identify size of the area that is below grade in the public comments of the listing information. You may also provide additional information that would be of value to the marketing of the property such as identifying the depth of the level below grade. This approach will also be applicable for stacked townhouses with identical units. Can I use the size listed in a municipal tax roll as the RMS if I disclose where I got the information? Can I use the size in a listing database from a previous listing of the property? No. Real estate professionals have an obligation to their clients to perform their due diligence. Measuring the property according to the RMS or having it measured by a qualified individual is part of that due diligence. There is no guarantee as to the accuracy of the previous listing’s measurements and the property may have been renovated or added to since it was last listed which could have changed its area measurements. Can I use the condominium unit registered size as the RMS size? No. You must use the RMS. What happens if the RMS size is larger than the condominium unit registered size? If the RMS is larger than the condominium unit registered size, you should recheck your calculations. In the majority of cases, the condominium unit registered size will be larger than the RMS size because most condominium unit registered sizes include wall thickness and other areas such as such as garages, parking spaces, separate storage areas, below grade areas, and balconies. My seller client is upset because when they bought the property, the seller represented it as larger. What do I do? The seller may have purchased the property under a different size standard that provides a larger size value by including areas that are not included as part of the RMS. It is important for you to discuss this with the seller. When buyers purchase resale residential properties, there is often a correlation between the property size and the sale price, but the correlation is not proportional. The property’s size is only one of many factors that influence the sale price. Other factors include the property’s location, layout, style, modernization, finishing, amenities, etc. Explain to the seller that their property has not shrunk, and that all real estate professionals who are listing properties will measure according to the RMS so there is consistency, and there will not be a competitive disadvantage. If the seller’s property is attached and you believe buyers will compare it to detached properties, you can advise the seller that you will also communicate the assumed exterior size. Why don’t non-industry members such as home builders have to use the RMS? RECA only has jurisdiction through the Real Estate Act over real estate, mortgage brokerage, real estate appraisal, and property management professionals.